Is this 1959 or 2014? Prayers for a Change | "A Song Every Day"
Posted on August 19, 2014 by vspatz	in Berakhot, Gender, prayer and tagged Beruriah, DC4MikeBrown, Ferguson, Rabbi Meir, tefillin, Tefillin Barbie. 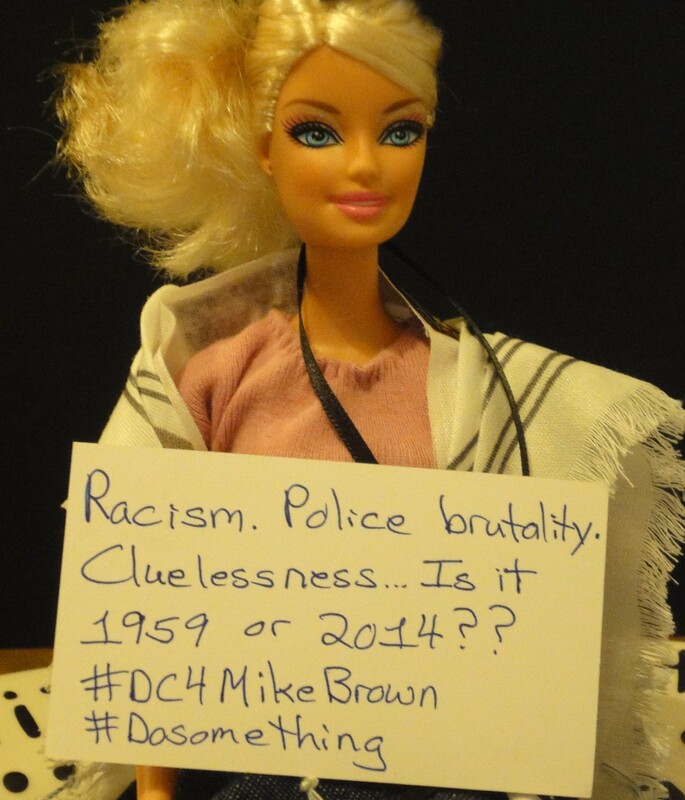 DC Tefillin Barbie would love to focus on her passions of Jewish text and gender studies. But — don’t let that frozen smile fool you — she’s got other pressing concerns as well. She finds, in fact, that concern for the racial tensions exploding in Ferguson, MO, and around the country dominate her prayers. From Your wisdom, God most high, grant me [wisdom], and from Your understanding, give me understanding. Help me understand how our country remains so divided and how to help promote a better vision and a more just reality. May Your loving-kindness be greatly upon me, and in Your might may my enemies and those who rise against me be subdued. Pour Your godly oil on the seven branches of the menora so that Your good flows down upon Your creatures. There are so many areas of the globe in need of attention, but may our collective actions bring more divine flow to Ferguson, MO, and other spots in need of extra oiling. You open Your hand and satisfy every living thing with Your favor. May these straps, donned in prayer, remind me to keep my hands on productive, positive work for a better world and keep my mind away from panic, hatred, or despair.